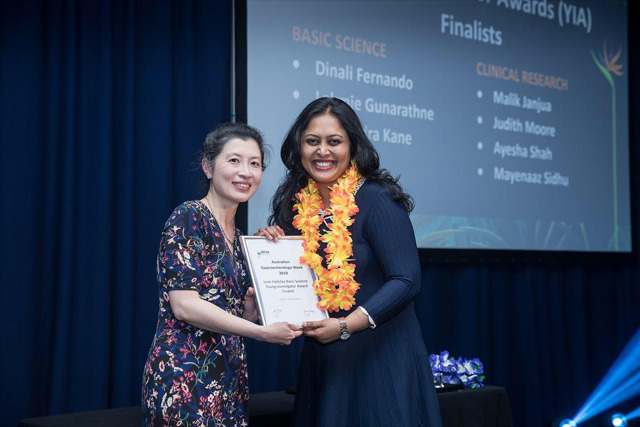 ​PhD student Lakmie Gunaratne of the Hepatology Research Group, the Department of Medicine, University of Melbourne, Austin Health, was awarded a prestigious Young Investigator Award at the Australian Gastroenterological Society (GESA) conference held in Brisbane on 8-10 September 2018. Lakmie competed with three other finalists selected from a pool of 143 candidates. Lakmie has discovered a novel receptor linked to splanchnic vasodilatation in cirrhotic portal hypertension. She found blocking this vasodilator receptor leads to increased splanchnic vascular resistance, resulting in a significant reduction in portal blood flow and portal pressure in two cirrhotic portal hypertensive rat models. These finding are important because portal hypertension and bleeding from oesophageal varices is the major cause of morbidity and mortality in patients with cirrhosis. The main therapy used to prevent variceal bleeding is non-selective β-blockers (NSBBs); however, randomised clinical trials show around 15% of cirrhotic patients are intolerant of NSBB treatment, and up to 60% fail to achieve the treatment response required to prevent variceal bleeding. These findings were earlier accepted as a late-breaker at The International Liver Congress (ILC), organised by the European Association for the Study of the Liver (EASL), held in Paris on 11-15 April 2018. For this work, Lakmie has been awarded a young investigator travel bursary to attend the ILC in Paris. Lakmie is supervised by Dr Chandana Herath and Professor Peter Angus. 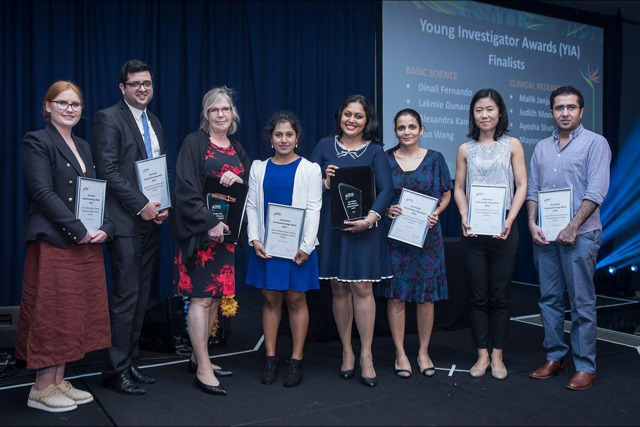 PhD student Dinali Fernando, also supervised by Dr Herath and Professor Angus, was a finalist in the GESA Young Investigator Award competition. Professor Narci​ Teoh (left) presented the GESA Young Investigator award to PhD student Lakmie Gunaratne​ (right).